Above is 15 minutes of our hour and 17 minute conference call discussing the first two chapters of the Inner Game of Tennis, the classic mental training text which tells us now to quiet the Inner Coach in all of us, and access deeper capacities found in our instincts and body. Yesterday we had our first conference call discussing the Inner Game of Tennis, and it was more or less awesome. Just having people from around the world reading the same text together, and bouncing ideas off of each other shows what is possible with tech today, it’s an experiment in discussion that is already taking off. For those interested, this post by Sylvie talks about the reading group. 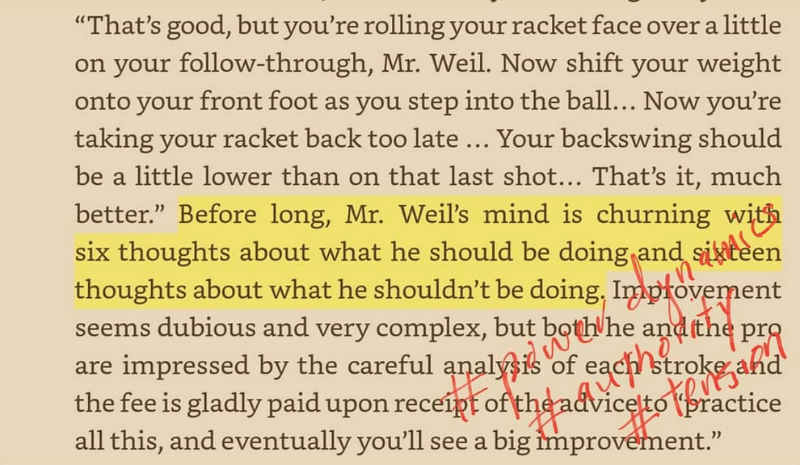 Today was the first meeting for the reading group, focusing on chapters 1-2 of The Inner Game of Tennis. In short summary, the first chapter is about the revelations the author had as a tennis instructor, that he got more out of his students and they got far more out of his lessons when he gave less verbal instruction. Instead, he focused more on “showing and feeling” rather than telling. The author admits this was a blow to his ego, as he felt the need to justify his authority (and likely his paycheck) as a “teacher,” and so he felt compelled and obligated to offer lots of verbal corrections. However, this tended to gum up his students. By observing and encouraging his students to feel their way through while imitating his example, everyone got a lot more out of each lesson. Kevin asked the group what they thought about this, as it seems that in western gyms the authority of a teacher is squarely in the position that the author finds himself at initially. Students expect and want lots of correction and instruction. Trainers want to have authority by giving and enforcing lots of correction and verbal instruction. It’s how we learn, so how do we “unlearn” this and move forward in a more natural way of learning, as the author discovered and ultimately wrote a now-classic book about? Mary is a fighter and also a coach at VIII Limbs Academy in Philadelphia. She noted that when she is instructing her partner and roommate, she finds it hard to not over-coach. Her intentions are all good, just wanting to give more and offer shortcuts to realizations she’s had, but the dynamic between Mary and her partner makes this even more complicated than it would already be with just a clean-cut student/teacher dynamic. I can relate. I feel over-coached by my husband, because he’s my husband, even if he offers the same points that my trainer might, or even something I already know to be true. This is a good example of how over-thinking can be with the best intentions, as well as how our pre-existing emotions, relationships, thoughts, feelings, etc. influence our learning processes. Casey and Yvonne are both dealing with long-term injury, so the relationship between mental and physical expression is poignant to their current experiences. Kevin had pointed out that how we feel about any given movement influences how it fits into our arsenal. I thought this was relevant to Casey and Yvonne’s injuries because, when injured, you end up feeling pretty pissed and sometimes depressed about what you can’t do, rather than focusing on what you can. Yvonne looked for examples of folks who couldn’t train with their feet, which she is experiencing with her injury, and replicated those examples to a positive outcome. Casey had a profound experience of “learning to walk again,” with her broken leg, looking around her at people just naturally walking to try to understand the mechanics because her body had “forgotten.” This is a great example of how the author of The Inner Game has developed his teaching – toward a natural process of watching and imitating. Believing that you already know how to walk is a good thing (she didn’t really forget), but when the mechanics offer new struggles, getting out of the mind-trap of thinking that you cannot walk anymore and just letting the body figure it out is what her doctor advised. If you’d like to read along with us, you can get The Inner Game of Tennis here . We’ll be live on Friday October 19th, 10:30 am Thai Time (Oct 18th, 11:30 pm New York time), if you’d like to get in on the discussion. You can get the link as a patron here. If that time isn’t convenient you can watch the full discussion video at your leisure. You can also follow and join in the reading group in the Open Facebook Group: MTMT Reading Group – Reading for a Better Muay Thai which is open to everyone, and where notes from our discussion and reading will be posted. You are free to join in. For my part, I’m very interested in aspects of Gallwey’s approach that maybe are not emphasized so often. I’m posting my notes from my readings on my Instagram. In particular I find the idea that coaches in the west feel a pressure to over-instruct because the way that gyms and commerce function is that you as a coach repeatedly have to prove your value to changing customers. This can lead to lots of verbal corrections, which while technically quite correct, may actually retard learning in a client. You can see this in this note. I’m a little interested in how unconscious power dynamics are structured by the situation students and teachers find themselves in, in the west, dynamics which are quite different from otherwise more traditional transmissions of knowledge. These differences in teaching may result in very different skill levels. I was also interested in the way that Gallwey is leading us to tap into what he calls Self II. I see this as us circumventing our conceptual brain, and accessing what is basically 100 million year old software, the ways our bodies have evolved through eons of iterations to navigate space, anticipate movement and intention, and to learn through mirroring. These largely are not skills the human animal developed in the last 10,000 years, so much as through the epics of life before that. When a software has gone through that much development iteration, it is probably pretty damn good at what it’s good at. I’m only 2 chapters in, but I think in very different words, that is what Gallwey is talking about. Getting into our deeper operating system. Our Lymbic Brain. Our virtual reality (spatially projective) Brain. You can see this in this note. 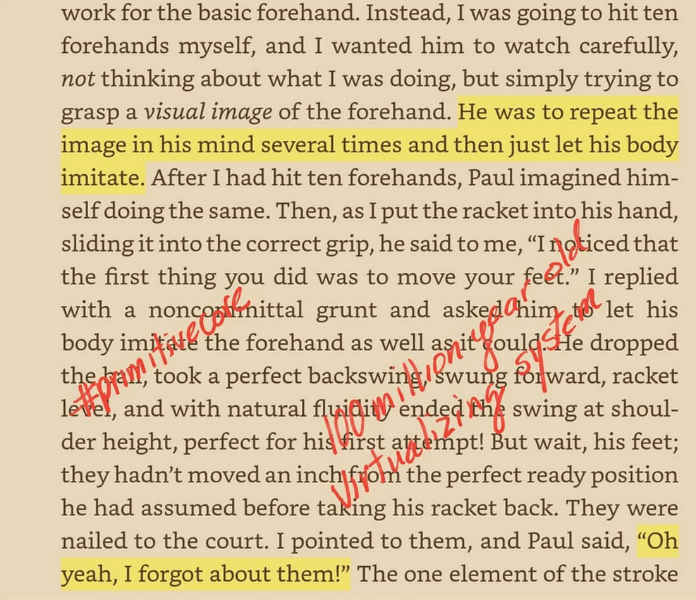 Sylvie in the reading group talks a lot about the connections between the Inner Game of Tennis and Vipassana meditation. As a fighter she is ever honing her inner experiences, and her ability to become aware of them, and direct them to best ends. For me, I’m interested in structures and operative patterns that shape how we have that those experiences. I’m always looking for element keys, that if changed, would send a process in a very different direction. You can read along looking for your own application of the ideas in this beautiful book. The reading sections are quite short, so it’s easy to get up to speed, and this is a book that many have said changed their life. If you’d like to join in you can see our full discussion here on Patreon. If you become a patron at that level you’ll get access to the greatest internet resource for Thai technique in the world, the Muay Thai Library. So join Us for the Next Meeting, or join the public discussion on Facebook.